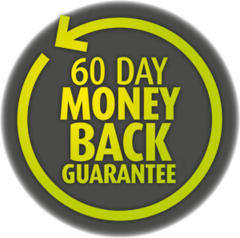 A sixty (60) day money back guarantee is offered on each of CTFO's products and product packages on the purchase price paid, less any shipping and handling fees. This offer is good ONE TIME per customer. All containers used/unused, full/empty must be returned and must arrive back to the CTFO warehouse prior to 60 days after the original shipment date. If you have questions about this guarantee, please contact us at ChewTheFatOff@gmail.com.